Proden Technologies Enterprise Services revolves around its flagship product accel<>BI to complement its offering by the way of providing value added services aimed at helping our Customers to achieve rapid return on investment (ROI). The pillar stones of accel<>BI’s Rapid Business Intelligence Development methodology is based on Build <> Preview<> Extend <> Deploy phases. Our methodology sharply contrasts existing approaches, and even enhances the modern and well accepted Agile approach, by the virtue of the Preview phase. We are strong proponents for a Preview phase once the BI Model is built, so Users have early access to real analytical reports to understand the scope, ensure data accuracy and usefulness, such as solution. As the picture here depicts accel<>BI’s toolset can shrink the timeline during various phases of a BI Project. Our enterprise services revolves around accel<>BI to complement our offering by the way of providing value added services aimed at helping our Customers to achieve rapid return on investment (ROI). Hiring Proden Product / Subject Matter Experts during the initial stages of accel<>BI deployment helps you to cut down the learning curve and get right to the task of Reports Development, generation of Starter Set of Reports, Performance analysis of BI Reports etc., from Day One. accel<>BI’s Report Generator builds a representative set of reports across your Model, let Users preview it and gather feedback. Proden Product / Subject Matter Experts will help you to configure accel<>BI’s Reports Generator to generate Starter Set of Reports, check the results, make any needed adjustments which will result in a shorter timeframe to get to, for example, Conference Room Pilot (CRP) sessions or User Preview sessions. Proden Product / Subject Matter Experts will also work with your development team to extend and customize the Starter Set of Reports to suit your needs. Quality Analysis Configuration and Setup Services includes validating your Business Intelligence Model, monitoring Reports performance, conducting Source to Report data accuracy using accel<>BIâ€™s suite of products namely Model Validator and Quality Analyzer. This includes configuring the Validator, configuring performance metrics, identifying key metrics for Source to Report validation, identifying and configuring reports for Unit testing / data accuracy. Proden Product / Subject Matter Experts will work with you to identify key metrics, reports, critical areas to track and help you to configure those. Regardless of a sound architecture and well thought out Modeling, you still need to tune performance as you approach your User Acceptance (UAT) phase. 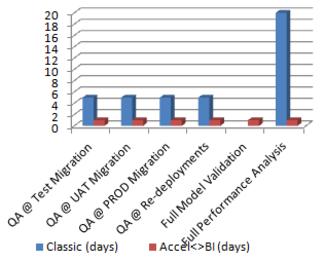 One of the key challenges during a BI Implementation even before going live is to gauge the performance of critical reports during peak usage, such as during month end close. This helps the BI Manager to take corrective actions such as fine tuning underperforming reports. Proden armed with Performance Monitoring and Stress Testing tools built specifically for BI Platforms can identify performance bottlenecks, resolve them using simple to advanced techniques based on the root cause. Some of the complex corrective actions may include design / architectural changes such as creating aggregate tables, creating skinny fact tables or even boosting the Server with more processing and /or memory. As you work iteratively to resolve performance issues across your large BI Model and tens or even hundreds of reports, accel<>BIâ€™s toolset such as Quality Analyzer, StressIT helps you to automate the performance monitoring process and more importantly drastically reduces the timeframe needed to measure and re-measure performance after each corrective actions. Proden has packaged the above mentioned services such as performance analysis, Quality analysis as ongoing support services. These support services can be availed when you are actively implementing your BI Solution or you are in Post Production phase. For example, a Proden consultant once accel<>BI is configured and setup to work can act as a FTE Full Time Equivalent help the Customer to constantly monitor performance bottlenecks as identified by accel<>BI and take corrective actions. Also, provide Quality Assurance support such as help the Customer to create new Source and Unit Test plans as the Customer builds new reports, actively monitor Performance and Quality test results and take needed actions.